Over the past couple of years, I have wrestled with the thought of taking our carved jack-o-lanterns and simply throwing them into the garbage after Halloween night. It didn't feel like the most environmentally-friendly option and it certainly wasn't the most dignified option for something that we took precious time to carve by hand. 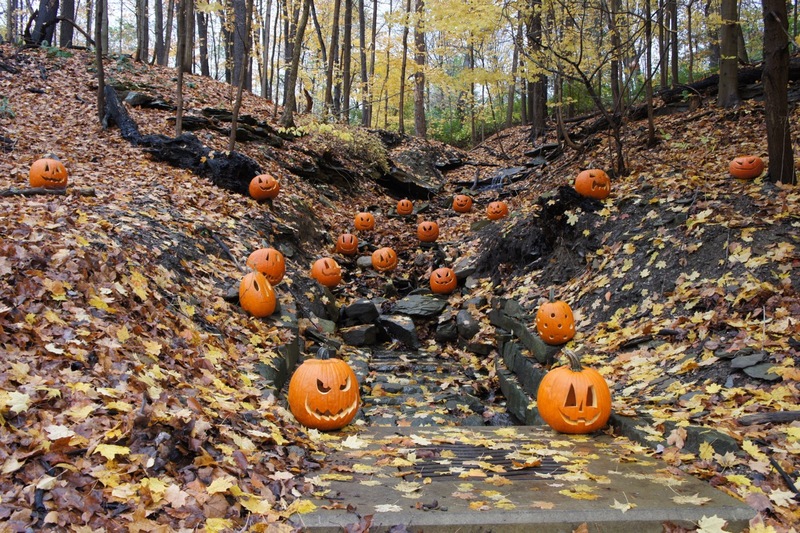 So right after Halloween night this year, I came up with a rather fun and mischievous plan to give our jack-o-lanterns a proper send-off. 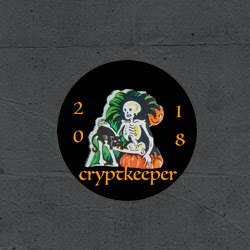 I've always been a huge fan of The Great Pumpkin Project, but I have always lacked the time to actually place any jack-o-lanterns before the big night. Until now! My plan was to take the jack-o-lanterns, find a somewhat hidden spot in the local Metropark system that surrounds my neighborhood, and then anonymously place them for others to discover. 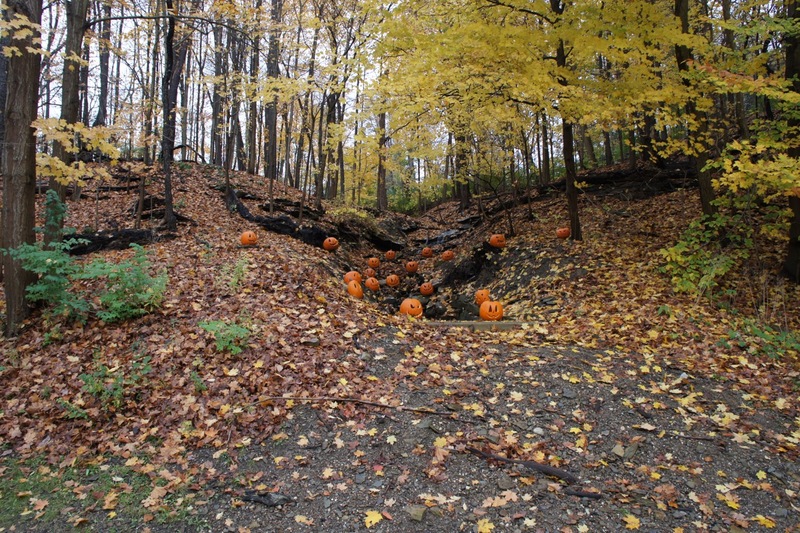 I picked the best spot from a list of about 4 or 5, and loaded up the car with all 18 jack-o-lanterns. I quietly pulled into the undisclosed location and quickly went to work, placing each in a firm, yet very visible location all down a rocky stream embankment. It was perfect. When the photos were all captured, I went back to my car. I decided to grab my phone and send a quick photo over to Brother Scrapes to share in the hi-jinx. As I hit "send," an SUV pulled in next to me and two girls jumped out, screaming with joy, snapping photos with their phones. I couldn't believe it. Not 2 minutes after I had secretly set this up, people were already noticing it. After coyly observing the 4 onlookers, I decided to slip away. And as I pulled up the main access driveway, a Park Ranger was pulling in. My heart sank to my stomach. I drove past, exchanging a wave, and slipped away from everyone without incident. I couldn't believe my luck. 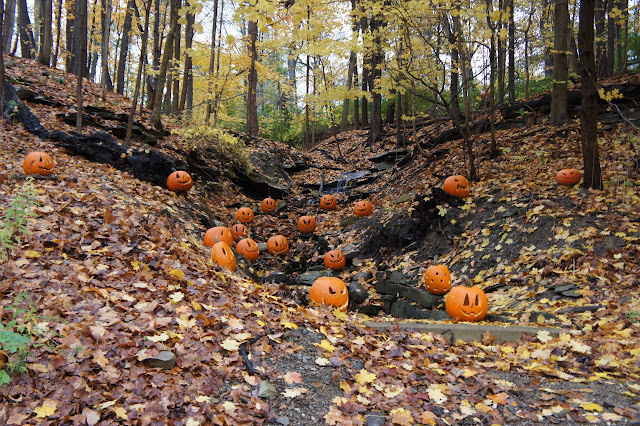 And as a side note, I checked the location early this morning, and all of the jack-o-lanterns were STILL there. 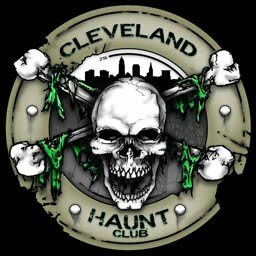 So if anyone is in the Northeast Ohio area, feel free to seek out and enjoy the setup before it's taken down. The only clues are that it is in a towpath trailhead parking lot and it is in the Akron, Ohio area. Good luck!! And if you happen to be from the Metroparks and you are reading this, please understand my rationale for doing this. Hopefully I'm not in any trouble! That is totally perfect! what a great idea. Awesome! We broke ours up and threw them here and there while walking in the woods. But I like your idea better! !